Ah, sweet sweet summertime! The flowers are blooming, the sun is shining, and are those birds chirping or my email notifications? During the summer months, my inbox is constantly flooded with emails from companies trying to catch my attention. Here are three creative summer emails that won me over. Jokes aside, outside of our beautiful San Francisco office, the weather is currently a windy 63 degrees. When summer hits, it’s easy to get carried away with exotic tropical vacation themes in every email, but it’s important to be realistic about who your audience is, and where they really are this summer. Outfits for everywhere I want AND need to be? My face lights up, and my fingers itch for my credit card. This simple but impactful subject line stays true to Nordstrom’s classic brand that shows their understanding of their audience’s needs. It universally appeals to Nordstrom’s diverse audience — whether they are sipping a fruity drink on a beach, or driving revenue dollars at work. Clicking into the email, the bright colors and sunny exposure make it clear that this is a summer wardrobe upgrade. The layout is clean and easy to navigate with different examples of three different places that you could go to this summer. The open ended question at the top “Where Are You Going?” once again keeps the ball in the reader’s court, instead of cornering them into a limited box. Furthermore, by including a section called “Shop Work”, the email remains inclusive of a segment of their audience that is sometimes overlooked in summer marketing campaigns. 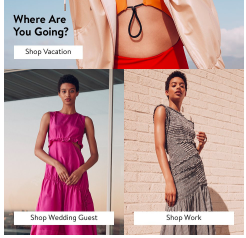 Nordstrom does an amazing job being inclusive of its audience’s diverse needs, yet still incorporates summer themes subtly within their brand. Caps Lock, flag emojis, and impactful spacing choices?! Sold. I was further lured in with the pun of waiving delivery fees (waving flags). The first thing that catches my eye when I open the email is the promotion code on the bottom. 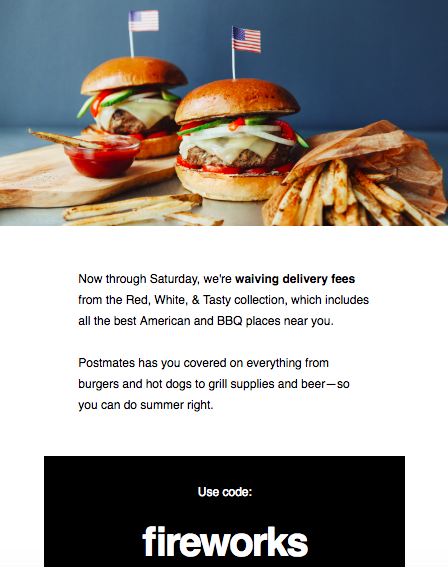 It’s important to take every opportunity to build trust with your consumer, and the fact that Postmates didn’t make me jump through any hoops to get my discount code does just that. Even small details like the parallel between the flag emoji in the subject line, and the flag in the burger further builds trust in the reader’s mind. From now on, I know that when I open an email from Postmates, I’m getting exactly what was promised in the subject line — no clickbait. 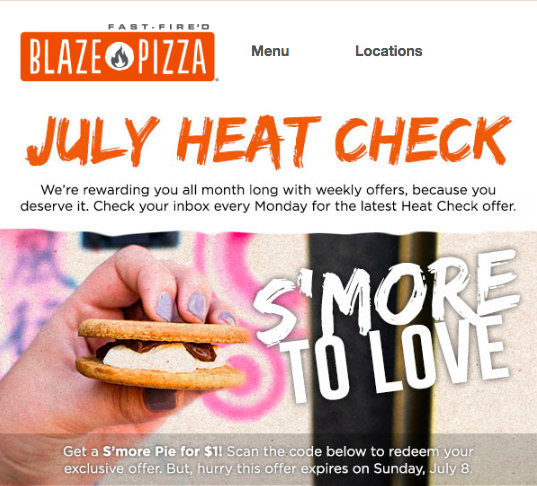 I’ll be honest, I click on every email from Blaze Pizza regardless of the subject line :). I mean how can you resist emails about pizza?? Huge orange text declaring “July Heat Check” welcomes me with summer vibes. I get excited when I realize that this isn’t a normal one-time pizza coupon — this is a MONTH long of deals! As I frantically click the pictures to learn more about the rest of the deals, I realize that they are grey scaled out because they are blocked and released weekly. 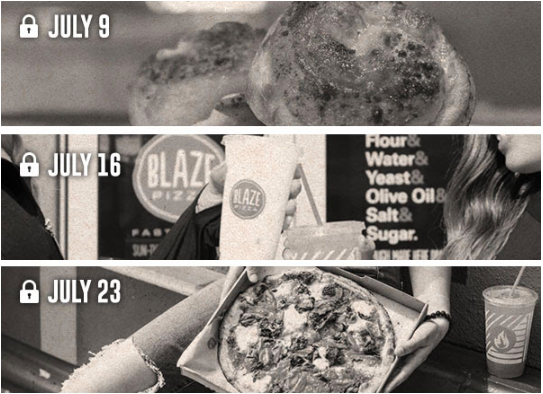 By releasing all the tantalizing promotional images all at once but not revealing any further details, Blaze pizza creates a sense of urgency and an incentive for the reader to engage with their emails on a weekly basis. You could apply a similar concept to your own campaigns with a month long giveaway or interactive features like a promotional game with prizes. The fact that each of the promotional images features a different product is also key because they are able to showcase a different menu item each week. Any Seasonal Marketing Strategies We Missed? What do you think? Have you applied any of these seasonal marketing strategies to your recent email campaigns? If not, there’s still time! Send out a limited-time offer with a summery twist, or a catchy subject line tastefully punctuated with emojis and watch your engagement soar. The eight corporate values we live by at SparkPost and how they foster a supportive environment ideal for growth and innovation.